Background: Leukemic blasts in acute lymphoblastic leukemia (ALL) may have immunological features of both lymphoid and myeloid lineages known as aberrant myeloid antigens expression in ALL, which are explained as abnormal genetic program of leukemic cells that lead to lineage infidelity. In this study, CD13, CD14, and CD33 (which are the most frequent myeloid antigens associated with aberrant antigens expression in ALL) were investigated. Objectives: To evaluate the occurrence of aberrant myeloid antigens expression in childhood ALL and its effects on complete remission and other parameters. Materials and Methods: This study was conducted on 31 pediatric patients with newly diagnosed de novo ALL (27 B-ALL, 4 T-ALL) in Children Welfare Teaching Hospital/Medical City of Baghdad; diagnosis of ALL based on morphology and cytochemistry, CD13, CD14, CD33 were investigated as myeloid antigens using four-color flow cytometry. Results: Five cases of ALL (16.13%) out of 31 cases were confirmed to have aberrant myeloid antigens expression (CD13 was expressed in all five cases, CD33 was expressed in three cases, and CD14 was not expressed in any of these five cases). Complete remission was achieved in 90.30% (28 patients) and all cases with aberrant myeloid antigens expression achieved complete remission; however, despite this, there was no significant difference in complete remission between myeloid-positive (MY+) and myeloid-negative (MY−) cases, P > 0.05. Regarding other parameters, there were significant statistical differences in lactate dehydrogenase (LDH), hemoglobin value, and bone marrow (B.M.) blasts percent at diagnosis between MY+ and MY− cases, P< 0.05; however, there was no significant differences in leukocytes count, platelets count, peripheral blood blast percent at diagnosis, age, and gender, P > 0.05. Conclusions: The most frequent aberrant myeloid antigens expression in childhood ALL is CD13 and less frequently is CD33 while CD14 showed no expression; myeloid antigens expression in ALL may have better prognosis as they have lower B.M. blast percent and LDH value. In this study, the frequency of conventional and aberrant antigens will be investigated in childhood ALL patients and diagnosed and treated at one institution, to detect if the presence of these aberrant antigens has a prognostic significance. 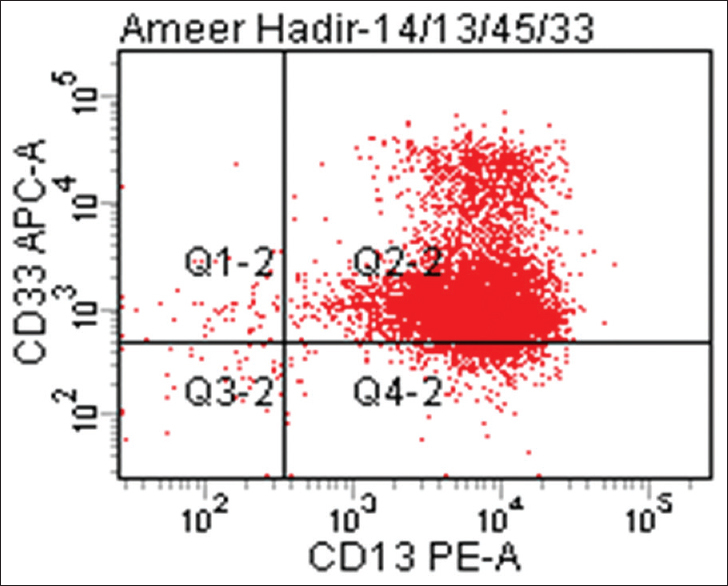 CD14 usually expressed alone without another myeloid antigens, so its expression represents an aberration more than activation of a certain program of differentiation. 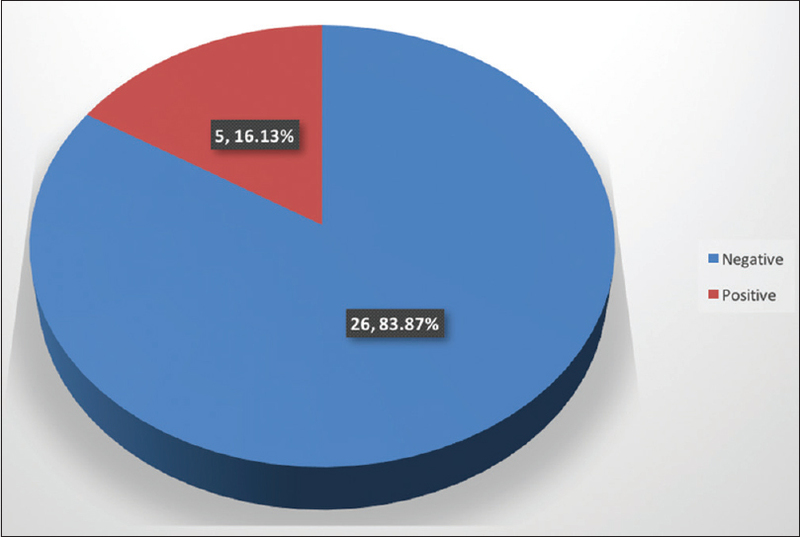 After taking consents from all patients, a prospective cross-sectional study was conducted on fresh samples obtained from 31 pediatric patients (age <15 years) with newly diagnosed ALL who were admitted from January 2016 to June 2016 to Hematology Department in Welfare Pediatric Hospital/Medical City. The diagnosis of ALL was made on routinely stained P.B. and B.M. aspirate smears and evaluated according to French-American-British criteria and also on cytochemical stain of B.M. aspirate film (Sudan black B, periodic acid-Schiff stain). Hepatic function, renal function, coagulation, and biochemical tests were performed for all patients in addition to the physical examination and imaging study; then, flow cytometric analysis was performed on P.B. samples, the sample was transferred in cool box within few hours after collection in ethylenediaminetetraacetic acid tube to be investigated for myeloid antigens expression (CD13, CD14, CD33) using four-color FCM, and suitable gate was detected depending on FSC/SSC gate. The sample was considered to be positive when the percentage of positive blast cells was equal to or >20%. After flow cytometric analysis, five cases out of the total 31 cases of ALL expressed aberrant myeloid antigens expression, CD13 expressed in all these five cases, while CD33 expressed in three cases and CD14 not expressed in any case [Table 1] and [Figure 1]. In this study, only pediatric age group was collected and the age distribution among this age group was divided into three categories as >1 year, between 1 and 9 years, and >10 years, the highest frequency of ALL cases was in age group 1–9 years, and the least frequency was in patient <1 year; according to the results of this study, there was no significant statistical differences in age between MY+ cases and myeloid-negative (MY−) cases. According to the collected sample in our work, the gender distribution of ALL was nearly equal between male and female and M: F ratio = 1.08:1. According to the results, there were significant statistical differences in hemoglobin (Hb) value, lactate dehydrogenase (LDH), and B.M. blast percent between MY+ ALL and MY− ALL, P < 0.05 (LDH, B.M. blast percent less in MY+ ALL and Hb value more in MY+ ALL at diagnosis); however, other hematological parameters such as white blood cell (WBC) count, platelet (PLs) count, P.B. blast percent, clinic reasoning (CR), and clinical presentation, there were no significant statistical differences between MY+ and MY− ALL cases [Table 2],[Table 3],[Table 4] and [Figure 2]. Five cases out of 31 patients with conventional ALL expressed aberrant myeloid-associated antigens; this finding was compatible with that established by Pui et al. in which MY+ ALL cases account for about 16.4% and less than that found by Kurec et al., Amirghofran et al., Tanyeli et al. in which MY+ ALL cases account for 49%, 30%, 48.4%, respectively.,, The differences in these outcomes may be due to the differences in definition (in some reports, considered MY+ ALL as two or more myeloid-associated antigens positive, while in other reports, considered MY+ ALL as one or more myeloid-associated antigens positive) and also may be due to variation in number of monoclonal antibodies which were used in addition to ethical differences which may play a role in these variations. In the current work, there were no significant statistical differences in achieving complete remission between MY+ and MY− ALL cases despite all MY+ cases achieved CR and three out of 26 of MY− cases were not achieved CR and this finding was compatible with Wiersma et al., Amirghofran et al. which also introduced that there were no significant statistical differences in CR between MY+ and MY− ALL cases., This finding may be due to that there were no significant differences in most hematological parameters between MY+ and MY− cases or may be due to small sample size of all cases in general and MY+ ALL cases particularly, while in contrast to that findings of Bhushan B et al. which introduced that MY+ cases achieved CR more than MY− cases  and also discordant with Kurec et al. which reported that MY+ ALL achieved CR less than MY− cases. Uckun et al. 's results are generally consistent with these studies, in showing that myeloid antigen expression does not correlate with poor outcome for children with ALL and emphasize that their study provides new insight on the clinical significance of myeloid antigen expression in childhood ALL and shows that regardless of risk classification, ALL patients who are MY+ have treatment outcomes similar to those who are MY− ALL. While in the current study, significant statistical differences were found in Hb value at diagnosis (Hb value usually more in MY+ cases than MY− cases) and LDH value at diagnosis (LDH value usually less at diagnosis in MY+ cases than MY− cases), this result was approachable with that established by Pui et al. and conflicting with Tanyeli et al., Uckun et al., Wiersma et al. which instituted that there were no differences between MY+ and MY− ALL cases in these values ,, and also unfriendly with Amirghofran et al. which founded that CD33 usually associated with low Hb value. According to initial P.B. blasts and B.M. blasts percent, there were no significant statistical differences in P.B. blasts percent between MY+ and MY− cases, but there were significant statistical differences in initial B.M. blasts percent between MY+ and MY− ALL cases (B.M. blasts percent less in MY+ ALL than in MY− ALL at diagnosis); this finding was compatible with that reported by Lopes et al. The differences about the prognosis of myeloid antigens expression in ALL between studies may be due to the differences in treatment protocol, definition criteria of myeloid antigens expression in ALL, and populations. There was no difference in response to induction therapy between MY+ and MY− ALL. Supriyadi E, Veerman AJ, Sutaryo, Purwanto I, Vd Ven PM, Cloos J. Myeloid antigen expression in childhood acute lymphoblastic leukemia and its relevance for clinical outcome in Indonesian ALL-2006 protocol. J Oncol 2012;2012:135186. Bhushan B, Chauhan PS, Saluja S, Verma S, Mishra AK, Siddiqui S, et al. Aberrant phenotypes in childhood and adult acute leukemia and its association with adverse prognostic factors and clinical outcome. Clin Exp Med 2010;10:33-40. Estey EH, Faderl SH, Kantarjian HM. Hematologic Malignancies: Acute Leukemias. Berlin: Springer; 2014. Kurec AS, Belair P, Stefanu C, Barrett DM, Dubowy RL, Davey FR. Significance of aberrant immunophenotypes in childhood acute lymphoid leukemia. Cancer 1991;67:3081-6. Greaves MF, Chan LC, Furley AJ, Watt SM, Molgaard HV. Lineage promiscuity in hemopoietic differentiation and leukemia. Blood 1986;67:1-11. Pui CH, Robison LL, Look AT. Acute lymphoblastic leukaemia. Lancet 2008;371:1030-43. Copelan EA, McGuire EA. The biology and treatment of acute lymphoblastic leukemia in adults. Blood 1995;85:1151-68. Pui CH, Raimondi SC, Head DR, Schell MJ, Rivera GK, Mirro J Jr., et al. Characterization of childhood acute leukemia with multiple myeloid and lymphoid markers at diagnosis and at relapse. Blood 1991;78:1327-37. Pui CH, Behm FG, Crist WM. Clinical and biologic relevance of immunologic marker studies in childhood acute lymphoblastic leukemia. Blood 1993;82:343-62. Carroll WL, Bhojwani D, Min DJ, Raetz E, Relling M, Davies S, et al. Pediatric acute lymphoblastic leukemia. Hematology Am Soc Hematol Educ Program 2003;2003:102-31. Amirghofran Z, Shamseddin A, Shahriari M. Prognostic value of myeloid antigen expression in acute lymphoblastic leukemia. Med J Islam Repub Iran (MJIRI) 2000;14:111-4. Wiersma SR, Ortega J, Sobel E, Weinberg KI. Clinical importance of myeloid-antigen expression in acute lymphoblastic leukemia of childhood. N Engl J Med 1991;324:800-8. Toth B, Wehrmann M, Kaiserling E, Horny HP. Immunophenotyping of acute lymphoblastic leukaemia in routinely processed bone marrow biopsy specimens. J Clin Pathol 1999;52:688-92. Kaleem Z, Crawford E, Pathan MH, Jasper L, Covinsky MA, Johnson LR, et al. Flow cytometric analysis of acute leukemias. Diagnostic utility and critical analysis of data. Arch Pathol Lab Med 2003;127:42-8. Weir EG, Borowitz MJ. Flow cytometry in the diagnosis of acute leukemia. Semin Hematol 2001;38:124-38. Pui CH. Acute lymphoblastic leukaemia. In: Kaushansky K, Lichtman AM, Kipps JT, Seligsohn U, Prchal TJ, editors. Williams Hematology. 8th ed. China: McGraw-Hill Company; 2010. p. 2243. Béné MC, Nebe T, Bettelheim P, Buldini B, Bumbea H, Kern W, et al. Immunophenotyping of acute leukemia and lymphoproliferative disorders: A consensus proposal of the European LeukemiaNet Work Package 10. Leukemia 2011;25:567-74. Lopes TC, Andrade KN, Camelo NL, Rodrigues VP, Oliveira RA. Influence of aberrant myeloid expression on acute lymphoblastic leukemia in children and adolescents from Maranhão, Brazil. Genet Mol Res 2014;13:10301-7. Matutes E., BAIN BJ., Wotherspoon AC. Lymphoid malignancies: an atlas of investigation and diagnosis. Oxford, UK, Clinical Pub. ; 2007. Availabe from: http://www.123library.org/book_details/?id=1639. [Last accessed 2016 Oct 25]. Keohane E, Smith L, Walenga J. Rodak's Hematology: Clinical Principles and Applications. Missouri, USA: Elsevier Health Sciences; 2015. Bain BJ. Leukaemia Diagnosis. Oxford, UK: John Wiley & Sons; 2010. Grobe K, Sgori D, Balaian L, Freeman SD, Vitale C, Terstappen LW, et al. CD33-CD33 Molecule. WikiGenes. Available from: http://www.wikigenes. org/e/945.html. [Last accessed on 2016 Nov 11]. Webber BA, Cushing MM, Li S. Prognostic significance of flow cytometric immunophenotyping in acute myeloid leukemia. Int J Clin Exp Pathol 2008;1:124-33. Iwamoto S, Deguchi T, Ohta H, Kiyokawa N, Tsurusawa M, Yamada T, et al. Flow cytometric analysis of de novo acute lymphoblastic leukemia in childhood: Report from the Japanese pediatric leukemia/lymphoma study group. Int J Hematol 2011;94:185-92. CD14 – Medical Definition. Medilexicon. Available from: http://www. Medilexicon.com/medicaldictionary.php?t=18336. [Last accessed at 2016 Nov 11]. Pugin J, Kravchenko VV, Lee JD, Kline L, Ulevitch RJ, Tobias PS. Cell activation mediated by glycosylphosphatidylinositol-anchored or transmembrane forms of CD14. Infect Immun 1998;66:1174-80. Pui CH, Behm FG, Singh B, Rivera GK, Schell MJ, Roberts WM, et al. Myeloid-associated antigen expression lacks prognostic value in childhood acute lymphoblastic leukemia treated with intensive multiagent chemotherapy. Blood 1990;75:198-202. Tanyeli A, Erbey F, Bayram I, Kömür M. Myeloid antigen positivity in Turkish children with acute lymphoblastic leukemia lacks influence on prognosis. Asian Pac J Cancer Prev 2010;11:1823-6. Uckun FM, Sather HN, Gaynon PS, Arthur DC, Trigg ME, Tubergen DG, et al. Clinical features and treatment outcome of children with myeloid antigen positive acute lymphoblastic leukemia: A report from the Children's Cancer Group. Blood 1997;90:28-35.